Nonmelanoma skin cancers are the most common malignancies in transplant recipients under immuno-suppression; nevertheless, appendage tumors also may appear. The onset of several cutaneous neoplasms in transplant patients can cause dete-rioration in quality of life of these patients. A 62-year-old white woman patient developed several malignant and benign sebaceous neoplasms during an immunosuppressive treatment for a renal transplant. The genetic study showed a mutation in MSH6-eson 1 (c116G>A), without mutations in MLH1 gene and MSH2. A final diagnosis of multiple sebaceous tumors in an immunosuppressed patient without Muir–Torre syndrome was made. The spreading of further cutaneous neoplasms led to a change in immunosuppression: namely, that clinicians suspended tacrolimus and add everolimus. After 2 months, all tumor lesions on the face and on the limbs have disappeared, and no further lesions occurred. Everolimus could represent a valid therapeutical treatment for transplant patients at high risk for cutaneous tumors. A genetic consult and a consequent study of the genetic profile should be performed on each of these patients, to avoid risks of recurrent cutaneous tumors and negative effects on the quality of life. In recent times, evidence of resolution of multiple cutaneous neoplasms in transplant patients under treatment with everolimus, has marked an important stage in the role of proliferation signal inhibitors in this class of patients.3 We report the case of a transplant patient with multiple sebaceous neoplasms, who successfully regressed after switching the therapy with everolimus. Two histologic specimens from a 62-year-old white woman were examined in our dermato-pathologic laboratory. The medical history of the patient resulted being positive for a kidney transplant (because of renal failure) performed 23 years before, and as a result she assumed azathioprine, cyclo-sporine, and cortisone until 2004. In 2007, the patient underwent a second bilateral kidney transplant and related immunosuppressive therapy with tacrolimus, mycophenolic acid, and cortisone. The first specimen concerned a papular keratotic lesion at nasal level that arose in 3 months. The skin biopsy showed a poorly circumscribed follicular-centric proliferation with keratinocytes, which showed variable and atypical sebaceous differentiation (Figures 1A-1B). Based on these histopat-hologic findings, a diagnosis of sebaceous carcinoma was made. The second one was related to a cutaneous biopsy performed on the superior lip. Histologically, we observed a sharply circumscribed proliferation of keratinocytes with a central horn plug. Epidermis extended peripherally over tumor with a pale ground-glasslike keratinocytes. Focal sebaceous differentiations also were seen, and a final diagnosis of keratoacanthoma with sebaceous differentiation was made. Because of the particular histologic findings, we decided to perform a full clinical examination on the patient. 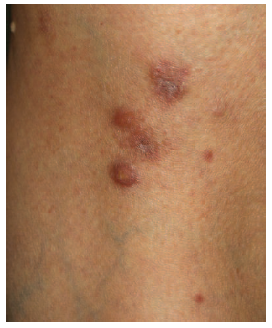 At the clinical examination we found multiple nodular keratotic lesions on the face and on the arms (Figures 2A-2B) along with an infiltrating nodular lesion on the posterior region of the right thigh, (Figure 3) for which a biopsy was performed. Histologic examination of the skin biopsy showed a poorly circumscribed clear-cell proliferation; the neoplastic cells at high magnification showed variable degree of sebaceous differentiation. The nuclei were scalloped with visible nucleoli and scattered mitoses. The proliferation was extended deep through the dermis into the hypodermal tissue. A final diagnosis of invasive sebaceous carcinoma was made. At this stage, due to the co-presence of multiple sebaceous tumors, we decided to perform a genetic study. Microsatellite instability, MLH1 gene, and MSH2 did not show abnormalities, while a mutation in MSH6-eson 1 (c116G>A) was detected. According to the clinical, histopathologic, 6 and genetic analyses, a diagnosis was made of multiple sebaceous tumors in an immunosuppressed patient after renal transplant. The spreading of further cutaneous neoplasms led to a change in the immunosuppressive treatment, which consisted of suspending tacrolimus and adding everolimus. After 2 months, all the tumor lesions on the face and on the limbs have disappeared, and no further lesions have occurred (Figures 4A-4B). The patient currently performs periodic clinical and instrumental controls, where no further cutaneous and/or systemic involvement has revealed. Renal transplant is a lifesaving procedure in patients with organ failure, and immunosuppressive therapies (such as corticosteroids, azathioprine, cyclosporine, tacrolimus, and sirolimus, or everolimus) are needed to minimize graft rejection.4 Regarding this, our patient showed the onset of several cutaneous neoplasms with different degrees of sebaceous differentiation 5 years after the renal transplant. In conclusion, everolimus could be a valid therapeutical treatment for transplant patients with a high risk for cutaneous tumors. However, a genetic consult and a successive study of the genetic profile should be performed for each patient to avoid the risk for recurrent cutaneous neoplasms and consequent negative effects on the quality of life. Further studies on the use of such drugs are needed, with evaluation of effectiveness in a general population of patients with multiple appendage tumors. CC, Maragh SL. Reduction of immunosuppression for transplant-associated skin cancer: rationale and evidence of efficacy. Dermatol Surg. 2005;31(2):163-168. Landis MN, Davis CL, Bellus GA, Wolverton SE. Immunosuppression and sebaceous tumors: a confirmed diagnosis of Muir-Torre syndrome unmasked by immunosuppressive therapy. J Am Acad Dermatol. 2011;65(5):1054-1058.e1. Euvrard S, Boissonnat P, Roussoulières A, et al. Effect of everolimus on skin cancers in calcineurin inhihitor-treated heart transplant recipients. Transpl Int. 2010;23(8):855-857. Mahmud N, Klipa D, Ahsan N. Antibody immunosuppressive therapy in solid-organ transplant: Part I. MAbs. 2010;2(2):148-156. Blake PW, Bradford PT, Devesa SS, Toro JR. Cutaneous appendageal carcinoma incidence and survival patterns in the United States: a population-based study. Arch Dermatol. 2010;146(6):625-632. Waiser J, Dell K, Böhler T, et al. Cyclosporine A up-regulates the expression of TGF-beta1 and its receptors type I and type II in rat mesangial cells. Nephrol Dial Transplant. 2002;17(9):1568-1577. Khanna AK. The immunosuppressive agent tacrolimus induces p21WAF/CIP1WAF1/CIP1 via TGF-beta secretion. Biochem Biophys Res Commun. 2003;303(1):266-272. Pascual J, Fernández AM, Marcén R, Ortuño J. 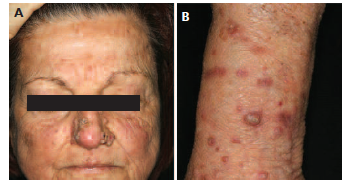 Conversion to everolimus in a patient with arterial hypertension and recurrent cutaneous neoplasia--a case report. Nephrol Dial Transplant. 2006 Jul;21(suppl 3):iii38-iii41. Inamoto T, Azuma H, Nonomura N, et al. Favorable outcome in elderly Asian patients with metastatic renal cell carcinoma treated with everolimus: the Osaka Urologic Oncology Group. Asian Pac J Cancer Prev. 2014;15(4):1811-1815. Kaminska EC, Iyengar V, Tsoukas M, Shea CR. Borderline sebaceous neoplasm in a renal transplant patient without Muir-Torre syndrome. J Cutan Pathol. 2013;40(3):336-340. Baglietto L, Lindor NM, Dowty JG, et al. Risks of Lynch syndrome cancers for MSH6 mutation carriers. J Natl Cancer Inst. 2010;102(3):193-201. Shalin SC, Lyle S, Calonje E, Lazar AJ. Sebaceous neoplasia and the Muir-Torre syndrome: important connections with clinical implications. Histopathology. 2010;56(1):133-147.